After reading deeply about so many people suffering, I’m falling back on the equivalent of musical comfort food. A double helping as this Sting song is one of my favorites, performed here by some of my favorite musicians. Seven weeks later mainstream media finally gets around to covering this report. I wonder how many more Yazidis have died or been degraded and tortured in that time. And I wonder if we’ll ever do anything constructive to halt the elimination of this people by a non-state (or state) actor. Before ISIS began its assault on the Yazidi, there were an estimated 800K to 1.5 million of them. Australia continues to ignore plight of refugees on Nauru (HRW) — Human Rights Watch and Amnesty International investigated the conditions of refugees held on Pacific Island of Nauru, to which Australia shunts ayslum seekers and refugees from other countries. In spite of earlier investigations over the last 15 months and subsequent demands for improvements by the Australian Human Rights Commission (AHRC), the Office of the United Nations High Commissioner for Refugees (UNHCR), a Senate Select Committee, and an independent investigator, Australia continues to do nothing about the appalling and abusive conditions on Nauru. The gross neglect is now policy by default. In opposition to Zeman, Prime Minister Bohuslav Sobotka has agreed to take 80 Syrian refugees. That’s far more than the U.S. has accepted on a proportional basis; we killed more Syrian civilians this month than that number. From Sententiae Antiquae, Corrupt Leaders Make Corrupt Countries: An Ancient Course on Leadership. Nothing new under the sun; sure looks like we’ve debated this topic for millennia. …οὐδὲ χωρὶς στρατηγῶν οὐδὲ μία πόλις ἐκπέμψει στρατόπεδον, οὐδὲ δίχα τοῦ δύνασθαι λέγειν αἱρήσεται στρατηγόν. …No land nor city will field an army without generals nor even choose a general who cannot speak effectively. How do you say, “Wishful thinking” in ancient Greek? Reindeer games here tomorrow, in spite of the season. See you then. Partnering with the Kiwis, NSA “Protects” Us from Climate Resistors? The Intercept has what will be the first in a series of partnering articles with New Zealand’s great surveillance reporter Nicky Hager on the role of New Zealand’s SIGINT agency, Government Security Communications Bureau, in the Five Eyes dragnet. As part of it, they target south Pacific islands that its hard to understand as a threat to anyone. Since 2009, the Government Communications Security Bureau intelligence base at Waihopai has moved to “full-take collection”, indiscriminately intercepting Asia-Pacific communications and providing them en masse to the NSA through the controversial NSA intelligence system XKeyscore, which is used to monitor emails and internet browsing habits. The documents identify nearly two dozen countries that are intensively spied on by the GCSB. On the target list are most of New Zealand’s Pacific neighbours, including small and vulnerable nations such as Tuvalu, Nauru, Kiribati and Samoa. Effectively, the NSA forces GCSB to spy on these teeny tiny countries in the middle of the Pacific in order to benefit from our dragnet. 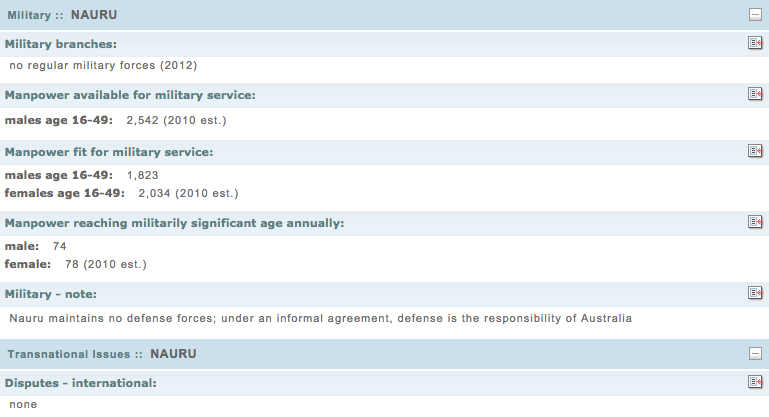 Even the CIA acknowledges that Nauru has no military, and it somewhat optimistically claims Nauru has no international disputes. The same is true of Tuvalu. Both have a dispute, of course. The rich lifestyles of the rest of the world (which Tuvalu shared in for a period of Phosphate exploitation) threaten to wipe these nations off the face of the earth with rising ocean levels. To the extent they might be threats to the US, it is because the citizens of Tuvalu and Nauru speak with the moral authority of some of the first peoples who will be wiped off the face of the earth because of climate change. Aside from that, Tuvalu has its own Internet domain; Nauru has become a tax haven. Still, it’s hard to believe that the most powerful country in the world, which has an active military population that is 136 times the population of these countries, is really threatened by either of these countries. But nevertheless, we’re forcing New Zealand to get “full take” from them, as the price of admission to our spying club. https://www.emptywheel.net/wp-content/uploads/2016/07/Logo-Web.png 0 0 emptywheel https://www.emptywheel.net/wp-content/uploads/2016/07/Logo-Web.png emptywheel2015-03-04 13:46:152015-03-04 13:47:59Partnering with the Kiwis, NSA "Protects" Us from Climate Resistors?